In the scenario of a Just War commend Cicero and his morality. Cicero’s writings include all the main elements of what today we call Just War Theory. This topic is broadly treated by John Mark Mattox in St. Augustine and the Theory of Just War, who supplies examples from Cicero’s writings of the specific principles of just cause, last resort, comparative justice, right intention, public declaration, proportionality, discrimination, and good faith. One may also easily identify these principles for oneself with reference to a single, short section, On Moral Duties 1.11.33 – 1.13.41. A fuller treatment of Cicero’s just war principles and theory, however, rightly deserves a dedicated article or book. Not only was Cicero an experienced politician himself, but the work that contains the essence of his just war theory, On Moral Duties, was written specifically as a long letter of advice to his son. Cicero had every reason to expect his son would, like him, one day reach a position of leadership (the younger Cicero did, in fact, later become consul) These complex factors, when blended with Cicero’s characteristic warmth, kindness, humanitarianism and love of country. Semi-realist in orientation, in contrast with the hard-line Realpolitik Cicero can regret as inhumane and unnecessary the Roman destruction of Corinth, yet accept as necessary (and, hence, just) the similar razing of Carthage. The difference was that Carthage was a genuine threat and (in the Romans’ eyes) a brutal enemy, while Corinth was merely a potential threat to Roman hegemony. Last, we must give special attention to the distinctly religious orientation of Cicero’s works. Modern cultural commentators have pointed to the desirability of developing a non-sectarian spiritual framework for understanding and coping with the problems of the modern world. Ideally such a framework should be compatible with basic religious beliefs common to all religions, and also congenial to secular institutions like governments, public universities, etc. Cicero’s just war theory, along with the rest of his ethical writings, is firmly rooted in Platonic-Stoic religious ideas and virtue ethics. In particular, it is wedded to Stoic Natural Law theory; this holds, basically, that all that happens in the world is orchestrated by a Divine Intelligence, and that both justice and personal happiness are achieved by acting in concord with this plan. Failure to do so – for example, to wage war unjustly – must necessarily meet with divine disapproval and corrective punishment. nations to act justly. Importantly, this framework establishes a basis for judging an action moral or immoral that is absolute, not relative or merely based on expedience or utility. Indeed, one of Cicero’s main philosophical achievements is to drive home the point that (in war, as generally), what is immoral can never truly be expedient or advantageous. A second, related legacy of Cicero’s Stoic leanings is his emphasis on cosmopolitanism. That is, for Cicero, all human beings, enemies included, are part of the human family, to all of whom we have strong moral responsibilities. As part of a non-sectarian religious philosophy, Cicero’s just war theory is something that can be discussed and developed by members of all religions on an equal footing – something equally acceptable to Christians, Jews, Muslims, Hindus, Buddhists, Wiccans, New Age hippies, and agnostic theists alike. At present, any serious discussion of religious or spiritual moral principles by government officials, intellectuals, or public news media is a taboo. In consequence we have totally dissociated Just War Theory from spiritual and transcendental principles, which is both ineffective and absurd. 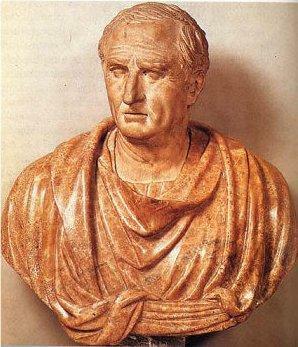 Let us, then, give Cicero’s just war theory a unprejudiced and thorough look. We may discover that Providence has, in his works, supplied many treasures. May 24, 2012 at 11:48 pm. John Uebersax is a psychologist, writer and former RAND Corporation military analyst. This entry was posted in America, apostasy, artists in conflict, barbarian, belief, Beliefs, beloved, civilization, Cloth, common moral law, conduct and tagged Cicero, Just War, military, Rand corporation, Roman Empire, Rome, theory and practice. Bookmark the permalink. ← How can moral freedom come into existence. Locke Satyagraha and its discontents.